SMALL SPACE DECOR IS FULLY FUNCTIONAL. Wow - what an entry way! 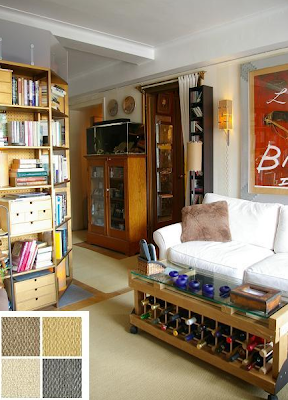 The owner has has used one of my favorite small space tips - using your walls - to store his magazine collection. I love how the filing cabinets double as storage for office papers and a place to hang artwork. Even the coffee table has a storage for the owner's wine collection. Clever! I have learned to love This Old House since Boy loves it and I end up watching it with him every now and then. It's a really good show and there are often tons of great ideas, including small space solutions. I spotted this studio in NYC on their website. The owner has truly used the footprint well. With just a few hundred sq feet, the owner took a 1 room space and has created tons of "rooms" to really live in and use. Click here to check it out. 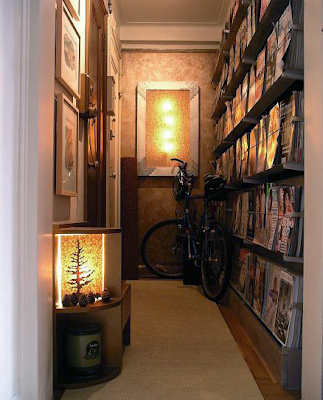 5 Responses to "SMALL SPACE TIPS via THIS OLD HOUSE"
i simply love the magazine storage!! 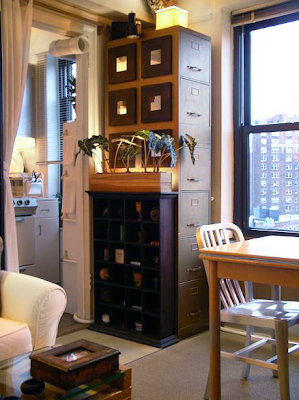 just found your blog and am hooked-- i live in the heart of manhattan in the smaaaaallest apartment ever!! Ooh, what a fun blog. I live in a small house and love it. I've linked. Can't wait to see more. ahh thanks Erica and Zoey! Love that you stopped by LLS! I totally agree, jennifer! The storage is fab!